For other uses, see A Study in Scarlet (disambiguation). A Study in Scarlet is an 1887 detective novel by British author Arthur Conan Doyle. Written in 1886, the story marks the first appearance of Sherlock Holmes and Dr. Watson, who would become the most famous detective duo in popular fiction. 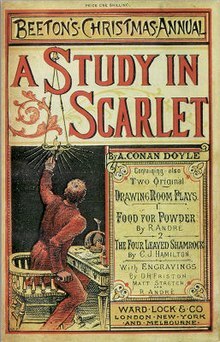 The book's title derives from a speech given by Holmes, a consulting detective, to his friend and chronicler Watson on the nature of his work, in which he describes the story's murder investigation as his "study in scarlet": "There's the scarlet thread of murder running through the colourless skein of life, and our duty is to unravel it, and isolate it, and expose every inch of it." The story, and its main characters, attracted little public interest when it first appeared. Only 11 complete copies of the magazine in which the story first appeared, Beeton's Christmas Annual for 1887, are known to exist now and they have considerable value. Although Conan Doyle wrote 56 short stories featuring Holmes, A Study in Scarlet is one of only four full-length novels in the original canon. The novel was followed by The Sign of the Four, published in 1890. A Study in Scarlet was the first work of detective fiction to incorporate the magnifying glass as an investigative tool. First book edition cover, 1888. Part I leads with a heading which establishes the role of Dr. Watson as narrator and sets up the narrative stand-point that the work to follow is not fiction, but fact: "Being a Reprint from the Reminiscences of John H. Watson, MD, Late of the Army Medical Department." The story begins in 1881, when Dr. Watson, having returned to London after serving in the Second Anglo-Afghan War, visits the Criterion Restaurant and runs into an old friend named Stamford, who had been a dresser under him at St. Bartholomew's Hospital. Watson confides in Stamford that, due to a shoulder injury that he sustained at the Battle of Maiwand, he has been forced to leave the armed services and is now looking for a place to live-before his six-month half-pay pension runs out. Stamford mentions that an acquaintance of his, Sherlock Holmes, is looking for someone to split the rent at a flat at 221B Baker Street, but he cautions Watson about Holmes's eccentricities. Stamford takes Watson back to St. Bartholomew's where, in a laboratory, they find Holmes experimenting with a reagent, seeking a test to detect human hemoglobin. Holmes explains the significance of bloodstains as evidence in criminal trials. After Stamford introduces Watson to Holmes, Holmes shakes Watson's hand and comments, "You have been in Afghanistan, I perceive." Though Holmes chooses not to explain why he made the comment, Watson raises the subject of their parallel quests for a place to live in London, and Holmes explains that he has found the perfect place in Baker Street. At Holmes's prompting, the two review their various shortcomings to make sure that they can live together. After seeing the rooms at 221B, they move in and grow accustomed to their new situation. Watson is amazed by Holmes, who has a profound knowledge of chemistry and sensational literature, very precise but narrow knowledge of geology and botany; yet knows little about literature, astronomy, philosophy, and politics. Holmes also has multiple guests visiting him at different intervals during the day. After much speculation by Watson, Holmes reveals that he is a "consulting detective" and that the guests are clients. Facing Watson's doubts about some of his claims, Holmes casually deduces to Watson that one visitor, a messenger from Scotland Yard is also a retired Marine sergeant. When the man confirms this, Watson is astounded by Holmes' ability to notice details and assemble them. Holmes reads the telegram requesting a consultation in a fresh murder case. He is reluctant to help because credit would go entirely to the officials. Watson urges him to reconsider so Holmes invites him to accompany him as he investigates the crime scene, an abandoned house off the Brixton Road. Holmes observes the pavement and garden leading up to the house before he and Watson meet Inspectors Gregson and Lestrade. The four observe the crime scene, Holmes using a magnifying lens and tape measure. The male corpse, he's told, has been identified as a very wealthy man named Enoch Drebber. Blood has been found in the room but there is no wound on the body. They also learn from documents found on his person that he was in London with his secretary, Joseph Stangerson. On one wall, written in blood, is "RACHE". Correcting an erroneous theory of Lestrade's, Holmes remarks that it is the German word for "revenge." He goes on to deduce that the victim died from poison and supplies a description of the murderer: six feet tall, disproportionately small feet, florid complexion, square-toed boots and smoking a Trichinopoly cigar. His right-hand fingernails are long and he arrived in a cab whose horse had three old shoes and a new one. Holmes says "RACHE" was a ploy to fool the police. Upon moving Drebber's body, the pair discovers a woman's gold wedding ring. Soon, Holmes and Watson visit the home of the constable who had first discovered the corpse, paying him a bit for the disturbance. They get little information Holmes didn't already know, other than that a seemingly drunk loiterer had attempted to approach the crime scene. Holmes chastises the officer for not realizing that this was the murderer himself in disguise. They leave and Holmes explains that the murderer returned on realizing that he'd forgotten the wedding ring. Holmes dispatches some telegrams including an order for a newspaper notice about the ring. He also buys a facsimile of it. He guesses that the murderer, having already returned to the scene of the crime for it, would come to retrieve it. The advertisement is answered by an old woman who claims that the ring belongs to her daughter. Holmes gives her the duplicate, follows her, and returns to Watson with the story: she took a cab, he hopped onto the back of it, he found that she had vanished when it stopped. This leads Holmes to believe that it was the murderer's accomplice in disguise. 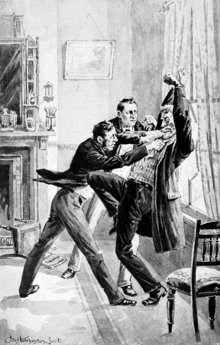 A day later, Gregson visits Holmes and Watson, telling them that he has arrested a suspect. He had gone to Madame Charpentier's Boarding House where Drebber and Stangerson had stayed before the murder. He learned from her that Drebber, a drunk, had attempted to kiss Mrs. Charpentier's daughter, Alice, which caused their immediate eviction. Drebber, however, came back later that night and attempted to grab Alice, prompting her older brother to attack him. He attempted to chase Drebber with a cudgel but claimed to have lost sight of him. Gregson has him in custody on this circumstantial evidence. Illustration by George Wylie Hutchinson (1892); Hope is arrested. Lestrade then arrives revealing that Stangerson has been murdered. Lestrade had gone to interview Stangerson after learning where he had been rooming. His body was found dead near the hotel window, stabbed through the heart. Above his body was written “RACHE”. The only things Stangerson had with him were a novel, a pipe, a telegram saying "J.H. Is in Europe", and a small box containing two pills. The pillbox Lestrade still has with him. Holmes tests the pills on an old and sickly Scottish terrier in residence at Baker Street. The first pill produces no evident effect, but the second kills the terrier. Holmes deduces that one was harmless and the other poison. Just at that moment, a very young street urchin named Wiggins arrives. He's the leader of the Baker Street Irregulars, a group of homeless children Holmes employs to help him occasionally. Wiggins states that he's summoned the cab Holmes wanted. Holmes sends him down to fetch the cabby, claiming to need help with his luggage. When the cabby comes upstairs and bends for the trunk, Holmes handcuffs and restrains him. He then announces the captive cabby as Jefferson Hope, the murderer of Drebber and Stangerson. The Mormon Nauvoo Legion, considerably overlapping with the Danites. The story flashes back to the Salt Lake Valley in Utah in 1847, where John Ferrier and a little girl named Lucy, the only survivors of a small party of pioneers, lie down near a boulder to die from dehydration and hunger. They are discovered by a large party of Latter-day Saints led by Brigham Young. The Mormons rescue Ferrier and Lucy on the condition that they adopt and live under their faith. Ferrier, who has proven himself an able hunter, adopts Lucy and is given a generous land grant with which to build his farm after the party constructs Salt Lake City. Years later, a now-grown Lucy befriends and falls in love with a man named Jefferson Hope. 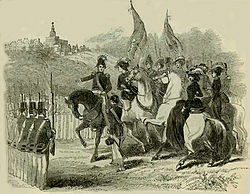 Lucy and Hope become engaged, with the ceremony scheduled to take place after Hope's return from a two-month-long journey for his job. However, Ferrier is visited by Young, who reveals that it is against the religion for Lucy to marry Hope, a non-Mormon. He states that Lucy should marry Joseph Stangerson or Enoch Drebber—both sons of members of the church's Council of Four—though Lucy may choose which one. Ferrier and Lucy are given a month to decide. Ferrier, who has sworn to never marry his daughter to a Mormon, immediately sends out a word to Hope for help. When he is visited by Stangerson and Drebber, Ferrier is angered by their arguments over Lucy and throws them out. Every day, however, the number of days Ferrier has left to marry off Lucy is painted somewhere on his farm in the middle of the night. Hope finally arrives on the eve of the last day, and sneaks his love and her adoptive father out of their farm and away from Salt Lake City. However, while he is hunting for food, Hope returns to a horrific sight: a makeshift grave for the elder Ferrier. Lucy is nowhere to be seen. Determined to devote his life to revenge, Hope sneaks back into Salt Lake City, learning that Stangerson murdered Ferrier and that Lucy was forcibly married to Drebber. Lucy dies a month later from a broken heart; Drebber, who inherited Ferrier's farm becomes wealthy after converting the land to cash and is indifferent to Lucy's death. Hope then breaks into Drebber's house the night before Lucy's funeral to kiss her body and remove her wedding ring. Swearing vengeance, Hope stalks the town, coming close to killing Drebber and Stangerson on numerous occasions. Hope begins to suffer from an aortic aneurysm, causing him to leave the mountains to earn money and recuperate. When he returns several years later, he learns that Drebber and Stangerson have fled Salt Lake City after a schism between the Mormons. Hope searches the United States, eventually tracking them to Cleveland; Drebber has Hope arrested as an old rival in love; released from jail Hope finds that the pair then flees to Europe, where for a month he stays on their trail (St. Petersburg, Russia; Copenhagen, Denmark; Paris, France) eventually landing in London. This is the story the handcuffed Hope willingly tells to Holmes, Lestrade, Gregson, and Watson. In London, Hope became a cabby and eventually found Drebber and Stangerson at the train station in Euston about to depart to Liverpool for the United States. Having missed the first train, Drebber instructed Stangerson to wait at the station and then returned to Madame Charpentier's house. After an altercation with Madame Charpentier's son, Drebber got into Hope's cab and spent several hours drinking. Eventually, Hope took him to the house on Brixton Road, which Drebber drunkenly entered believing it was a hotel. Hope then forced Drebber to recognize him and to choose between two pills, one of which was harmless and the other poison. Drebber took the poisoned pill, and as he died, Hope showed him Lucy's wedding ring. The excitement coupled with his aneurysm had caused his nose to bleed; he used the blood to write “RACHE” on the wall above Drebber. Hope realized, upon returning to his cab, that he had forgotten Lucy’s ring, but upon returning to the house, he found Constable Rance and other police officers, whom he evaded by acting drunk. He then had a friend pose as an old lady to pick up the supposed ring from Holmes's advertisement. Hope then began stalking Stangerson's room at the hotel; but Stangerson, on learning of Drebber's murder, refused to come out. Hope climbed into the room through the window and gave Stangerson the same choice of pills, but he was attacked and nearly strangled by Stangerson and forced to stab him in the heart. He has stayed in London only to earn enough money to go back to the United States, although he admits that after twenty years of vengeance, he now has nothing to live for or care about. After being told of this, Holmes and Watson return to Baker Street; Hope dies from his aneurysm the night before he is to appear in court, a smile on his face. One morning, Holmes reveals to Watson how he had deduced the identity of the murderer [Using the one clue of the wedding ring, he had deduced the name from a Telegram to the Cleveland Police regarding Drebber's marriage] and how he had used the Irregulars, whom he calls "street Arabs," to search for a cabby by that name. He then shows Watson the newspaper; Lestrade and Gregson are given full credit. Outraged, Watson states that Holmes should record the adventure and publish it. Upon Holmes's refusal, Watson decides to do it himself. Conan Doyle wrote the novel at the age of 27 in less than three weeks. As a general practice doctor in Southsea, Portsmouth, he had already published short stories in several magazines of the day, such as the periodical London Society. The story was originally titled A Tangled Skein, and was eventually published by Ward Lock & Co. in Beeton's Christmas Annual 1887, after many rejections. The author received £25 in return for the full rights (although Conan Doyle had pressed for a royalty instead). It was illustrated by David Henry Friston. The novel was first published as a book in July 1888 by Ward, Lock & Co., and featured drawings by the author's father, Charles Doyle. A second edition appeared the following year and was illustrated by George Hutchinson; a year later in 1890, J. B. Lippincott & Co. released the first American version. Numerous further editions, translations and dramatisations have appeared since. As the first Sherlock Holmes story published, A Study in Scarlet was among the first to be adapted to the screen. In 1914, Conan Doyle authorised a silent film be produced by G. B. Samuelson. Holmes was played by James Bragington, an accountant who worked as an actor for the only time of his life. He was hired for his resemblance to Holmes, as presented in the sketches originally published with the story. As early silent films were made with film that itself was made with poor materials, and film archiving was then rare, it is now a lost film. The success of the film allowed for a second version to be produced that same year by Francis Ford, which has also been lost. The 1933 film entitled A Study in Scarlet, starring Reginald Owen as Sherlock Holmes and Anna May Wong as Mrs Pyke, bears no plot relation to the novel. Aside from Holmes, Watson, Mrs. Hudson, and Inspector Lestrade, the only connections to the Holmes canon are a few lifts of character names (Jabez Wilson, etc.) The plot contains an element of striking resemblance to one used several years later in Agatha Christie's novel And Then There Were None. The book has rarely been adapted in full, but notable instances were an episode broadcast on 23 September 1968 in the second season of the BBC television series Sherlock Holmes, with Peter Cushing in the lead role and Nigel Stock as Dr. Watson, which put more detail into the story, including the actor who claims the ring; the second episode of the 1979 Soviet TV adaptation, Sherlock Holmes and Dr. Watson (the first episode combines the story of their meeting with "The Adventure of the Speckled Band"; the second episode adapts the actual Jefferson Hope case. ); a 1983 animated version produced by Burbank Films Australia, with Peter O'Toole voicing Holmes; A Study in Scarlet was the first episode of the BBC's complete Sherlock Holmes on Radio 4 in 1989, dramatised by Bert Coules and starring Clive Merrison as Holmes, Michael Williams as Watson, Donald Gee as Inspector Lestrade, and John Moffatt as Inspector Gregson; and a 2007 episode of the American radio series The Classic Adventures of Sherlock Holmes. In both the 1968 television adaptation featuring Peter Cushing and the 1983 animated version featuring Peter O'Toole, the story is changed so that Holmes and Watson already know each other and have been living at 221-B Baker Street for some time. Other adaptations use only the portions of the first section of the book in which Holmes and Watson's relationship is established. The Ronald Howard/H. Marion Crawford television series used that section of the book as the basis for the episode "The Case of the Cunningham Heritage". Steven Moffat loosely adapted A Study in Scarlet into "A Study in Pink" as the first episode of the 2010 BBC television series Sherlock featuring Benedict Cumberbatch as a 21st-century Sherlock Holmes, and Martin Freeman as Dr. Watson. The adaptation retains many individual elements from the story, such as the scribbled "RACHE" and the two pills, and the killer's potentially fatal aneurysm (however it is located in his brain rather than his aorta). However, the entire backstory set in America is omitted, and the motivation of the killer is completely different. It also features Moriarty's presence. Also, the meeting of Holmes and Watson is adapted in the Victorian setting in the special "The Abominable Bride". In 2010, A Study in Scarlet was adapted for the stage by William Amos Jr and Margaret Walther. "The Deductionist", an episode of Elementary, contains many elements of Hope's case, including the motivation of revenge. The story was more closely adapted in the season 4 episode, "A Study in Charlotte." "The First Adventure", the first episode of the 2014 NHK puppetry series Sherlock Holmes, is loosely based on A Study in Scarlet and "The Adventure of the Six Napoleons". In it, Holmes, Watson and Lestrade are pupils at a fictional boarding school called Beeton School. They find out that a pupil called Jefferson Hope has taken revenge on Enoch Drebber and Joseph Stangerson for stealing his watch. "Scarlet Story", the series' opening theme tune, is named after the novel and the name of "Beeton School" is partially inspired by Beeton's Christmas Annual. A Study in Scarlet was illustrated by Seymour Moskowitz for Classics Illustrated comics in 1953. It was also adapted to graphic novel form by Innovation Publishing in 1989 (adapted by James Stenstrum and illustrated by Noly Panaligan) and by Sterling Publishing in 2010 (adapted by Ian Edginton and illustrated by I.N.J. Culbard). According to a Salt Lake City newspaper article, when Conan Doyle was asked about his depiction of the Latter-day Saints' organisation as being steeped in kidnapping, murder and enslavement, he said: "all I said about the Danite Band and the murders is historical so I cannot withdraw that, though it is likely that in a work of fiction it is stated more luridly than in a work of history. It's best to let the matter rest". Conan Doyle's daughter has stated: "You know, father would be the first to admit that his first Sherlock Holmes novel was full of errors about the Mormons." Historians speculate that "Conan Doyle, a voracious reader, would have access to books by Fannie Stenhouse, William A. Hickman, William Jarman, John Hyde and Ann Eliza Young, among others," in explaining the author's early perspective on Mormonism. Years after Conan Doyle's death, Levi Edgar Young, a descendant of Brigham Young and a Mormon general authority, claimed that Conan Doyle had privately apologised, saying that "He [Conan Doyle] said he had been misled by writings of the time about the Church" and had "written a scurrilous book about the Mormons." In August 2011, the Albemarle County, Virginia, School Board removed A Study in Scarlet from the district's sixth-grade required reading list following complaints from students and parents that the book was derogatory toward Mormons. It was moved to the reading lists for the tenth-graders, and remains in use in the school media centres for all grades. In his Naked is the Best Disguise (1974), Samuel Rosenberg notes the similarity between Jefferson Hope's tracking of Enoch Drebber and a sequence in James Joyce's novel Ulysses, though of course Joyce's work did not begin to appear in print until 1918. Several other associations between Conan Doyle and Joyce are also listed in Rosenberg's book. The British fantasy and comic book writer Neil Gaiman adapted this story to the universe of horror writer H. P. Lovecraft's Cthulhu Mythos. The new short story is titled "A Study in Emerald" (2004) and is modelled with a parallel structure. ^ Conan Doyle, A. A Study in Scarlet, "Chapter 4: What John Rance Had to Tell"
^ "bestofsherlock.com, ''Beeton's Christmas Annual 1887: An Annotated Checklist and Census''". Bestofsherlock.com. Retrieved 2012-09-15. ^ Sweeney, Susan Elizabeth (2003). "The Magnifying Glass: Spectacular Distance in Poe's "Man of the Crowd" and Beyond". Poe Studies/Dark Romanticism. 36 (1–2): 3. ^ Baring-Gould, William S. The Annotated Sherlock Holmes: The Four Novels and the Fifty-six Short Stories Complete. London: Murray, 1973. ^ Lehan, Daniel (1998) & The City in Literature, University of California Press, p. 86. ^ It is mentioned that Dr. Watson had been attached to the Fifth Northumberland Fusiliers as Assistant Surgeon after taking his degree of Doctor of Medicine of the University of London in 1878. ^ "Inscribed copy of Sherlock Holmes' debut book for sale" Telegraph, UK. 24 May 2010. ^ "Who is this forgotten Sherlock Holmes?". Web.archive.org. 2008-02-12. Archived from the original on 12 February 2008. Retrieved 2012-09-15. ^ a b Bunson, Matthew (1994). Encyclopedia Sherlockiana: an A-to-Z guide to the world of the great detective. Macmillan. p. 255. ISBN 978-0-671-79826-0. ^ Taves, Brian (1987). Robert Florey, the French Expressionist. New Jersey: Scarecrow Press. p. 152. ISBN 0-8108-1929-5. ^ Alan Barnes (2002). Sherlock Holmes on Screen. Reynolds & Hearn Ltd. p. 178. ISBN 1-903111-04-8. ^ Alan Barnes (2002). Sherlock Holmes on Screen. Reynolds & Hearn Ltd. p. 108. ISBN 1-903111-04-8. ^ "A Study in Scarlet". The BBC complete audio Sherlock Holmes. Bert Coules. Retrieved 20 January 2016. ^ "The Classic Adventures of Sherlock Holmes (radio show 2005-2014)". The Arthur Conan Doyle Encyclopedia. 30 July 2015. Retrieved 21 January 2016. ^ Barnes, Alan (2011). Sherlock Holmes on Screen. Titan Books. p. 181. ISBN 9780857687760. ^ Sutcliffe, Tom (26 July 2010). "The Weekend's TV: Sherlock, Sun, BBC1 Amish: World's Squarest Teenagers, Sun, Channel 4". The Independent. UK. Archived from the original on 28 July 2010. Retrieved 28 July 2010. ^ Clisham, Kelly (10 August 2010). "Beloved Sleuths Hit the Stage". The Weekender. Archived from the original on 17 August 2010. Retrieved 10 August 2010. ^ "Tacit Theatre webpage". www.tacittheatre.co.uk. Retrieved 12 March 2015. ^ "Time Out London review". Retrieved 12 March 2015. Shinjirō Okazaki and Kenichi Fujita (Ed.) Guidebook of Sherlock Holmes, Tokyo, Shogakukan, 2014, pp. 32-35. ^ NHK's reply to the enquiry about the origin of the school's name. ^ a b c d Schindler, Harold (April 10, 1994), "The Case Of The Repentant Writer: Sherlock Homes' Creator Raises The Wrath Of Mormons", The Salt Lake Tribune, p. D1, Archive Article ID: 101185DCD718AD35 (NewsBank) . Online reprint Online reprint Archived 23 September 2006 at the Wayback Machine, with permission, at HistoryToGo.utah.gov by the Utah Division of State History, Utah Department of Heritage and Arts, State of Utah. ^ L. Jackson, Newell, ed. (1996). Matters of Conscience: Conversations with Sterling M. McMurrin. Salt Lake City: Signature Books. p. 74. ISBN 1560850876. ^ "34 (8.1) Recommendation of Reconsideration for the book "A Study in Scarlet" by Sir Arthur Conan Doyle". Albemarle County Public Schools. Retrieved 18 August 2011.